On this page you will find a range of training resources. Some are online and immediately accessible mostly in video format. On the right hand side bar, you will also find details of evaluation related training courses provided by different institutions in the West of England region. Some of these are free of charge, and some come with a course fee. These online resources have been designed to teach or refresh your skills in planning and carrying out an evaluation. They are freely available nationally to increase capacity and capability in designing evidence-based care. They are particularly aimed at staff in the health and social care sectors, and can be used as adhoc learning resources or incorporated into local training. The resources were created by staff from CLAHRC West and the West of England Academic Health Science Network (AHSN) with technical support from the University of the West of England (UWE Bristol). Please acknowledge these organisations when you share them. You can view the videos in any order, but when run sequentially (totalling 30 minutes), they make up key components of the successful classroom-based workshop run across the West of England, ‘Getting Started with Evaluation’. The slide deck used for this workshop is also freely available and can be found below the videos on this page. For more information contact Jo Bangoura. Q: What is evidence-informed commissioning? Q: What is the Evaluation Works toolkit? Q: Why is Evaluation important? Q: I need to do an evaluation. Where do I start? 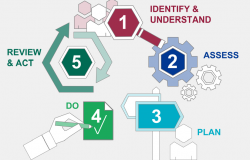 The approach used in the Evaluation Works toolkit is a five-step cycle, based on ‘Plan – Do – Study – Act (PDSA)’. Working through these videos, alongside cross referencing the evaluation toolkit, will provide you with knowledge, skills and resources to start planning your evaluation. This video explains how to define the aims and objectives of your evaluation, the key component of Step 3 (Plan). Taking time to nail this is the secret to a high-impact final evaluation report. It also makes for an engaging practical group activity to include in your local face-to-face evaluation training. (Duration: 3:49). We are very grateful to Michael Harris, Learning Technologist, UWE Bristol for his time and expertise in producing the Evaluation Works steps videos. Q: Where can I find the workshop slide deck? This slide deck of 28 slides is used to deliver a 2-hour workshop called ‘Getting started with Evaluation’ to commissioners across the West of England footprint. It is available for download on this site through the link above. The slides may be adapted for use in your local training session; speaker notes are included. Please acknowledge NIHR CLAHRC West and the West of England AHSN as the original creators when you use or adapt these slides.